Abstract: A case is presented of a 14-year-old male patient being treated with a fixed orthodontic appliance who presented with a persistent upper lip swelling. The patient was experiencing discomfort from the appliance and the appliance was debonded. A diagnosis of orofacial granulomatosis was established and the patient was managed carefully with a cinnamon- and benzoate-free diet leading to resolution of the swelling. 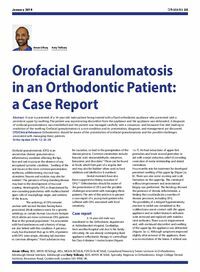 Orofacial granulomatosis is a rare condition and its presentation, diagnosis, and management are discussed. Clinical relevance: Orthodontists should be aware of the presentation of orofacial granulomatosis and the possible challenges associated with managing these patients. Author notes: Aman Ulhaq, BDS, MFDS RCS(Eng), MSc, MOrth RCS(Ed), FDS Orth RCS(Ed), Consultant/Honorary Senior Lecturer in Orthodontics, Edinburgh Dental Institute, Edinburgh and Katy Tidbury, BDS, MFDS RCS(Ed), Specialty Registrar in Orthodontics, King’s College Dental Institute, Bessemer Road, Camberwell, London SE5 9RW, UK. Objective: To describe the clinical presentation and management options for orofacial granulomatosis in orthodontic patients.